This dish brings the strength and flavors of the earth to your table through the mushrooms and the potatoes, both living in and from the soil. Portobellos are great meat substitute because of their texture. You can use them in burgers, sandwiches, soups and so much more. This dish may look fancy but it isn’t very complicated to prepare. It is highly flavored but low fat. It was inspired by a lovely dish I had at one of my favorite vegan restaurants in Portland called “Portobello Trattoria”. I just found out that in addition to being delicious, organic and vegan, they also only serve local and seasonal products and do not buy any products made by large corporations! That’s something. But I digress…Living in the Northwest, I now have access to an amazing choice of wild mushrooms. And you know what this means? Lots of mushrooms dishes coming! Yum! 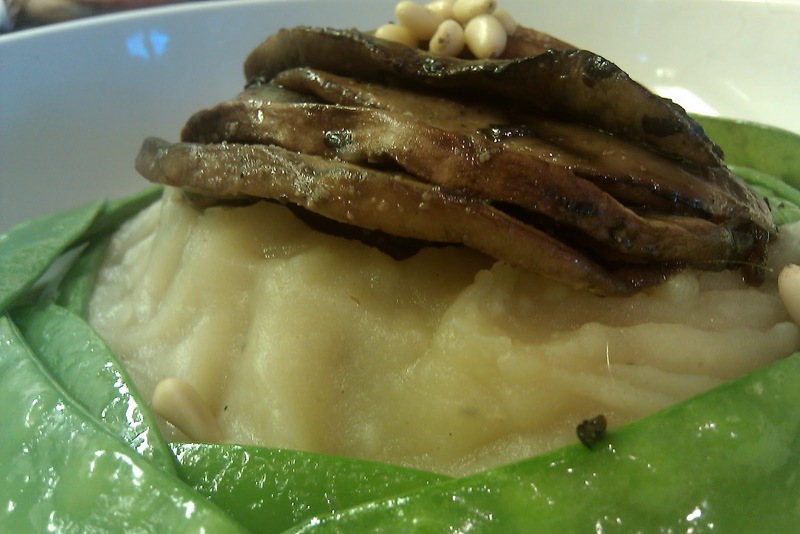 And since mash potatoes are always hit at home, why not combining them but in an elegant way. In a large pot, boil some water with salt and add the potatoes. Make sure there is enough water to cover them well. Cook until tender but not mush. Gently rince the portobello mushrooms to remove debris and slice them not too thin or the slices will fall apart when cooked. Have you ever noticed that the slices look just like the tail of a whale as it dives down in the ocean? If you have young kids around the house, this should get them entertained while you are preparing the meal! Pour hot water over mushroom broth or dry mushrooms, cover and set aside. In a non-sticky frying pan, heat up a teaspoon of oil, add the minced garlic and the green onions on top. Quickly move around the pan over medium heat so that it doesn’t burn. Place the slices of Portobello mushrooms in the pan without overlapping them. You may need 2 pans to do this, depending on how many mushrooms you are preparing. Drizzle a little balsamic vinegar making sure that you have some on every pieces and sprinkle a dash of salt. The vinegar will bring the sweetness out and caramelize them. Gently shake the pan so that nothing sticks and the juices are well mixed. Flip each slice and place a lid on top and lower the heat. You can remove from the heat when the juices have been lightly reabsorbed. Set aside covered. When the potatoes are cooked, with the help of a slotted spoon, scoop out the potatoes and place them in a blender, pour a little of the mushroom broth, some salt and pepper (garlic powder). Blend slowly at first, push down the potatoes if they need a little help, add broth very sparingly otherwise it will be too mushy and wet. Taste and season as you like. Now, who said you had to put a lot of butter in your mash potatoes to make them taste good? All you have to do is use some of the cooking water instead of milk and just a little of vegan butter (Earth Balance) when you serve it. That’s it! 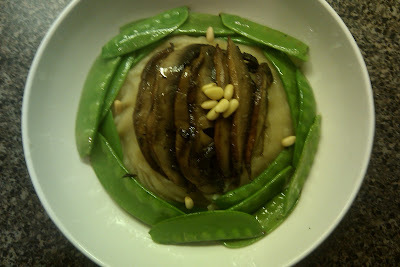 Heat up a tsp of oil in a frying pan, when hot, pour the snow peas and quickly move them around, sprinkle a little salt and you can also add a few Tbl of mushroom broth and cover for a minute. Lift the cover, let the steam come down. Mix well, remove from heat and set aside on a plate. This is up to you. I used a soup plate, made a dome in the middle with the mash potatoes, layered the portobellos on top and garnished the sides with the snap peas. Bon appétit! A serving of mushroom has no cholesterol, 5 mg sodium and 2.1 g protein. A 2/3 cup serving of Portobello mushrooms has as much potassium as a banana and good calcium too and only 26 calories per mushroom.